While their later releases ‘’Exterminate’’ and ‘’The Inexorable’’ will prove to be more cunning and technically surpassing albums, Angelcorpse’s debut album ‘’Hammer Of Gods’’ is not without flaws. 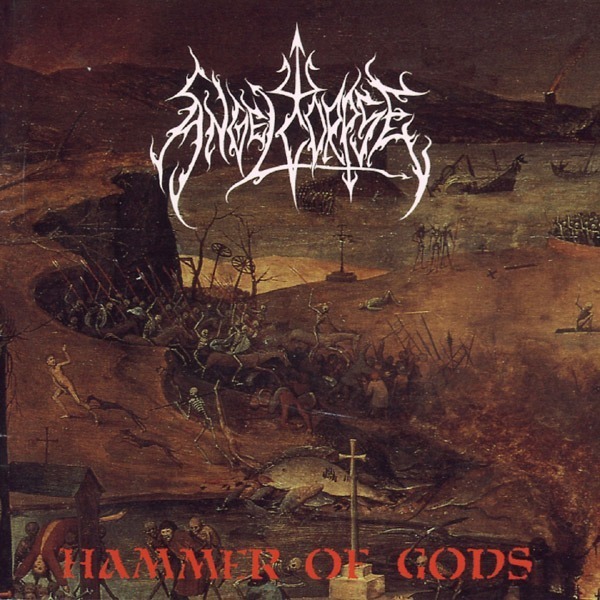 The third and second effort are closely related, both possessing a more lively edge and a processed portion of Angelcorpse’s savage attitude, but although ‘’Hammer of Gods’’ is just frenetic and just crazed with erupting blackened death metal fury, it’s clear that it hasn’t fully been turned into a credible substance, thus offering no more than pure demented aggression. 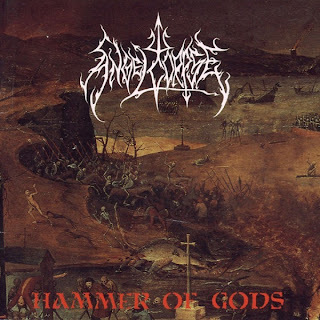 Even so, the debut remains as the most frantically driven and it beholds a strength that could reduce any man into cinder within the blink of an eye, therefore ‘’Hammer Of Gods’’ stands as Angelcorpse’s most barbaric incursion, although so of its blows may tend to miss its target. The overwhelming savagery has an obvious reason here. The musicianship hasn’t properly developed, and therefore we’re left with heaps of uncontrollable energy and callow riffs, enjoyable nonetheless. ‘’Hammer Of Gods’’ big flaw is the lack of prowess, but it’s also devoid of the spiking, sturdy guitar tone of ‘’Exterminate’’ (which augmented even further on ‘’The Inexorable’’), leading us to fibrous riffs, dispersing and scattering vigorously. Of course, the coarse jumble of tremolos and chords are totally gut-splattering. ‘’Hammer Of Gods’’ will punch you with its iron hammer again and again, and it will send a swirling vortex of chaos upon the remainders of your pulverized body to distort even further. Every song is just another strike of the hammer, numbing continuously, and your flesh will be all but gobs of meat when the album ends. If you want a tantalizing demonstration of Angelcorpse’s early sound, look no further than this record. 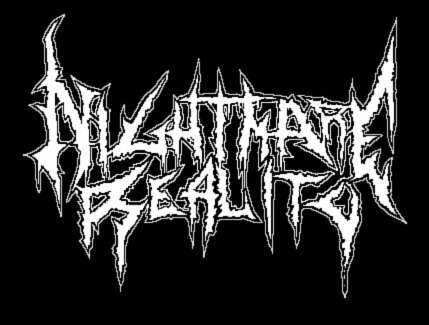 It’s accessible compared to the band’s demo material but still raw, demented and drunk with power. The drumming is simple, crude blast beats, while the vocals are throatier than ever, and the production is also a futile one, raw and decrepit. I can’t say that this is my favourite old school Angelcorpse record, but I can’t say I dislike it either, because after all, there’s still stuff here that would make your head jut up and down until snaps, and no matter how crude it is compared to its peers, I can’t help but enjoy this berserk black/death album.